The R-Group is called in by a U.S. Agency to find Pekoni then determine if he is really continuing his unethical practices. Funding for Pekoni's project were halted years before when it was uncovered the project volunteers, or unwilling participants went inexplicably missing. The background information the R-Group uncover surprises and sickens them to the point that verification of the data may be the only saving grace for someone close to the team. The personal demons of Petra and Jacob prevent either of them from effectively contributing to the team. Jacob distances himself from the R-Group and becomes unwittingly entangled with Zara, the villainous femme fatale leader of the Russian Dteam. After the seductive Zara steals 5 million in diamonds, she tries to hide in New York City where she learns something unexpected. Meanwhile, Buzz resurfaces to try to restart his life. Petra is hiding out unwilling to admit she is the same person as before the attack in Argentina. Each of their journeys takes them to a crossroad of decisions for the rest of their lives. With Petra and Jacob missing in action, EZ and Quip, supported by Julie and Juan's fledgling CATS team, are thrust into the forefront of the cyber battle. The feisty redhead and her wisecracking techno-genius team up with ICABOD against an evil force seeking to harness his supercomputer technology driving Pekoni's agenda. The team question their ability to meet the goals of the assignments without the full complement of their resources. Award-winning authors of The Enigma Series, Breakfield and Burkey, take readers on an accelerated adventure with old and new characters to tell the tale of human DNA changes gone wrong. 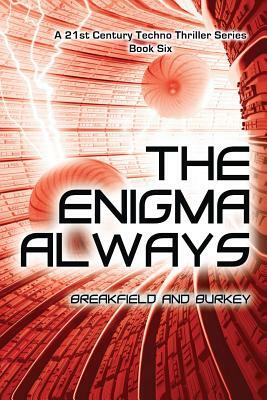 Book 6, The Enigma Always, continues the unique blend of technology laced with world travel, relationships, intrigue, suspense, romance, and mystery.